While the moments leading up to the fight emerged as one of the best ever, courtesy of Arnel Pineda’s news-worthy recital of the Philippine anthem, the big finish everyone wanted to see didn’t happen. 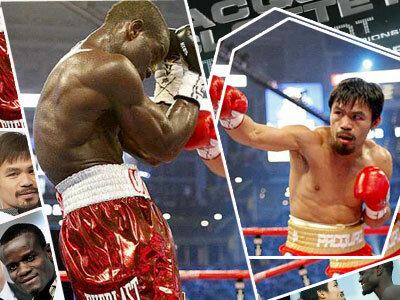 Pacquiao simply, effortlessly won by unanimous decision. Manny reportedly threw 1,231 punches, but only landing 246 of them. Not very surprising thanks to Clottey’s full-guard. The Ghanian challenger however didn’t even land half of Manny’s efforts with only 108. Coach Freddie Roach can be heard telling his kid "it's working" and "it's easy" at the end of the third round, a statement that would carry itself to the final bell. The Ghanaian phenomenon grooved his way into the ring, dancing as if he knows what the outcome of the fight will be, celebrating like a true contender finally getting his due. This would apparently be the last we’d see of the fast moving, agitated Clottey for the rest of the fight, as it turns out. There were a few significant moments that chilled us when Clottey brought out massive uppercuts and effective counter punches to an unsuspecting Pacquiao. He however left the punching duties to Manny 80% of the time.